July 1, 2009 was a historic day for NOPE. Our organization has hawkishly pressed U.S. Senators Robert Menendez and Frank Lautenberg to express their opinions on the Laurelwood housing issue, whether favorable or unfavorable to NOPE. Or course we hoped they'd side with our perspective that no civilian should ever live on NWS Earle, but were simply looking for some public commentary on the issue, as the people of New Jersey should know where our congressmen stand on this particular issue. The letter Messrs. Menendez and Lautenberg to Secretary of the Navy (The Honorable Raymond Mabus), as read aloud by Menendez aide Kellie Drakeford at the Wednesday press conference at Earle and requesting that the Navy conduct a full cost benefit analysis, cemented their objections to both a haphazard EIS and concern about the safety of our communities. The credit here goes largely to Kellie Drakeford and Keith Roachford of Mr. Menendez's office, who reached out to us on many occassions over the past few months and facilitated a rational and amicable solution to our request. 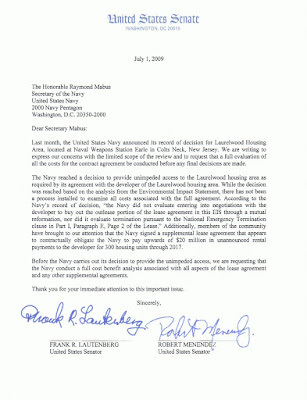 The letter, while falling short of explicit reference to our security concerns, clearly touches on one issue that NOPE has long argued - that the Navy should exercise its right to simply terminate the Laurelwood contract under the National Emergency Termination clause on page 2 of the lease - while also addressing NOPE's discovery of a supplemental lease agreement ("SA-43") that could obligate the Navy to $20 million of additional rent payments through 2017 (contrary to its view that rent payments will cease on Sept. 30, 2010), in the event that Laurelwood has trouble renting the 300 housing units. NOPE will continue to press the Senators on this until full resolution of the Laurelwood issue.